They remembered they have a flying car. Maria Hill has been caught up in Congress hearings and is talking to Pepper Potts about it on the phone, she sees that those tailing her have been taken out. May approaches her in an alley and asks about who was running Tahiti, Hill doesn't know but says Fury buried it when he decided not to bury Coulson, which seems to be a riddle. Hill is apprehended by the FBI, but as she's workign for Stark Industries no one can do anything to her. 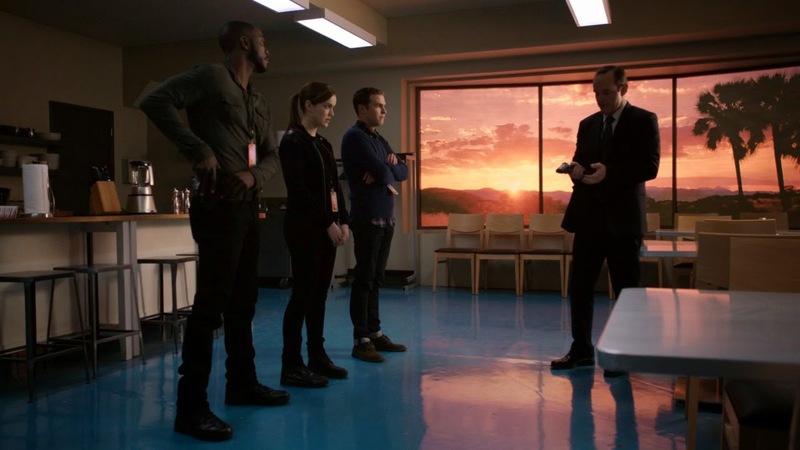 At Providence base Coulson, Fitz, Simmons and Trip piece together what happened. Base cameras have been wiped, but hangar cameras show May left alone (Coulson confirms he sent her away), then Ward and Skye took the plane while holding hands. Fitz sees the image-change window is mismatched in a bathroom, Skye jammed it in place and left a message saying Ward is Hydra. Looking for pancake ingredients Simmons finds Koenig's body. She examines it and determines that Ward killed him. Fitz can't accept that Ward did it, so Coulson gets him to focus on finding the plane. Turns out it's in L.A., but as they trace it Agent Hill brings General Talbot and the US military to the base. She tries to talk the agents into handing themsleves over as she did, but Coulson explains that Ward is Hydra meaning Garrett's alive and Hand is dead. Coulson and Hill evade the military and go after Ward. Skye takes Ward to the diner where she met Mike Peterson in Pilot and pretends to decrypt the drive while distracting Ward. She contacts the police about him, but he notices the law enforcement attention. Skye runs out and tries to get arrested for safety, but she's intercepted by Deathlok and taken back to the plane. She lets Ward know what she thinks of him and refuses to say anything. Deathlok and Ward argue about what to do with her and Deathlok follows orders by stopping Ward's heart in front of Skye until she tells them the hard drive can only be accessed at a certain altitude. May digs up Coulson's empty grave. Hill confronts Ward on the runway, buying Coulson time to get on the plane. He didn't realise Deathlok was on the plane, and send Skye to the cargo bay, opening the door and fighting off the cyborg and Ward. 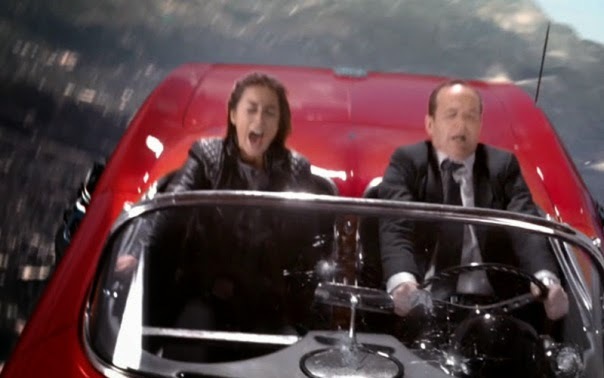 Coulson and Skye get in Lola (the flying car) and fall over L.A. just managing not to crash land. The team hide in a motel, Hill tells Coulson she's staying with Stark Industries and suggests Coulson's team disband after they've got Ward and Garrett. May is in Coulson's room and shows him a video she found in his coffin. It's a video of him saying he cannot run project Tahiti any more and recommending it is shut down. Trying to piece together what happened when they were away from the base Coulson is guilty about May leaving, and defensive when Trip dismisses her. Coulson analyses what they know trying to figure it out, best scenario is that Koenig has extra info, but Coulson starts to suspect he's got a traitor just before Fitz and Simmons make their discoveries. After Simmons makes her report Coulson tries to keep Fitz together by getting him to focus on tracking the plane and reassuring everyone (himself included) that Skye is playing Ward. He's really worried about her, but is reassured as he and Trip suss out Ward's motives and realise he needs Skye alive to decrypt the hard disk. When the base is breached Coulson is ready to defend it, but when Hill turns up he's angry that she's sold them out to improve the deal she's made with the US government. He's also angry that she's still trying to protect secrets while working for the private sector. When Hill hears about Ward she helps Coulson escape from the General's custody. Coulson sneaks onto the bus alone, assuming he's only dealing with Ward, so he's alarmed to hear Deathlok is there too. Coulson thinks Hill will keep supporting them in something like their old role, but she refuses, suggesting Coulson should work with Stark as she does. She describes the crusade against Garrett and Ward as a vendetta, since there aren't any official missions any more. At the end when May shows Coulson the video of himself describing Tahiti and it's flaws all Coulson can do is make a small shocked noise. Seems he's missing more memories than he realised. As stated at the end of the previous episode May is tracking down Agent Hill. She takes out the operatives following Hill and questions her about Tahiti. May points out that as Fury was taking orders from higher up, and the only one higher was Alexander Pearce, who was Hydra. Hill doesn't have answers either, but gives May the riddle that Fury gave her. Fury decided to bury "that intel when he decided not to bury Coulson." Hill maintains that Fury is dead, but May doesn't believe her. Later May is digging up a grave, scaring a lone mourner. It turns out it's Coulson's grave (though until we saw that I'd assumed it would be Fury's). At the end May does her thing of silently lurking in people's rooms and Coulson's glad she's back. Though the intel she's found is a huge shock to both of them. He's impatient with Skye's delays but still pretending to be good. He notices her tension, brushes off her suggestions and talks to her about going undercover. When Skye reveals that she's reported him he takes out law enforcement and tries to chase her. He's angry that Deathlok got so publicly involved, and that Garrett felt he needed watching. Though Deathlok has a point about Garrett's fears that Ward's soft spot for Skye will affect his judgement. Ward tells Skye about his feelings and claims all the betrayal isn't personal, Skye is disgusted. Ward is furious at Deathlok for the nearly killing him, but the cyborg says it's nothing personal, it's almost funny except things are pretty grim. Ward makes a sexist crack at Hill, suggesting people (probably a lot of them Hydra) lost respect for Fury when he promoted her to his lieutenant and saying that Black Widow is better eye candy. This doesn't phase Hill in the slightest and she says she'll tell Romanov that. It occurs to me that so far perhaps all the Hydra agents I've seen are men, figures. Ward wants to go back for Skye after Coulson rescues her, Deathlok won't let him as they have the hard drive now. Simmons just wanted to cheer everyone up with pancakes, but finds Koenig's body in the store cupboard. She does a quick post mortem and is distracted by Fitz's freak out. Keonig was garrotted in a hurry, after May left and by someone taller than him with the strength to lift his body into the ceiling. Only Ward could have done it. Simmons is defiant to General Talbot, ignoring his insistence that they're taken in and make themselves useful by explaining they need to rescue a friend from an actual Hydra agent. Simmons gives reassurance to Fitz at end that she'll never be Hydra. Fitz sees the message Skye left about Ward, smart of her to do so. He freaks out completely, refusing to believe it, wanting to find another explanation. When Simmons makes her report he smashes up things in the kitchen until Coulson gets him to focus on fixing the communications. At the end Futz tries to rationalise what Ward did, figuring he's been brainwashed or something. Unlike Simmons he refuses to believe someone could be just evil. Skye manages admirably in a difficult situation, able to convince Ward she's fine, while delaying him and trying to react to his lies and control. She makes conversation to distract Ward and try to find out his motives. When escaping she tries to get some cops to arrest her so she's away from Ward, she has to shove them before they'll do anything. Ward takes them pout immediately, so Skye tries to take the cop car, but Deathlok stops her. She's disgusted by Ward and his justifications about following orders. She's also disgusted that he's still interested in her and seems to think there could ever be anything between them, what with him being a murdering traitor. She beats him up as best she can, which doesn't do much to stop him but is nice to see. She accuses him of being a Nazi, which throws him, but this isn't a Godwin's Law thing since his evil organisation was founded by a Nazi. Though I can see that Hydra is a different thing to Nazis, but that kind of nuance doesn't seem necessary here. She almost falls out of Lola in mid air because she didn't buckle up, or even keep the parachute she was trying to put on. Trip comments to Coulson that Fitz is like a ninja with the comms, respecting his skills even though Fitz has been dismissive of him. Trip supports Coulson, talking things through with him and quietly checking in on how he is. With Ward and May gone Trip is definitely Coulson's new specialist, as he's the more experienced agent than Fitz and Simmons. At the end Trip declares his loyalty to Coulson. Of course he wants revenge on his betraying mentor Garrett, but he's already proved he's willing to die for Shield and Coulson seems to be the only person still committed to the fragmented and disgraced organisation. Only 2 episodes ago Coulson didn't want Trip on the plane because he didn't know him, but now Trip is part of the team. The video about the Tahiti project tells us Coulson was running things and reporting to Fury, he remembers none of this. The project was designed to possibly heal a mortally wounded Avenger, but seems to have had multiple subjects (presumably from Shield) who were given the alien biology. In all cases it has led to terrible side effects on mental health though whether it's the cure itself or the knowledge of what they've been through isn't clear. Video-Coulson says memory wipes are the only thing that's helped, but not always successfully. Coulson didn't feel he could continue doing this and recommended for the whole project to be discontinued. This is why May was ordered to observe him and as he'd come to object to the whole thing it's very clear the Coulson would never have consented to what was done to him. Ward and Deathlok. Skye tries to reason with Mike, telling him he's not a murderer, pointing out he refused to kill her in Italy and insisting they can help him. Mike refuses, he seems to have given up hope, though that's probably the only way he can cope. He also accuses Skye when the subject of his son comes up, he left Ace with her and told her to keep him safe. None of us ever saw Ace again, so Skye did kinda fail there a bit. Maria Hill (to FBI agents tracking her): 3 minutes and 20 seconds! Really? If you were my agents you wouldn't be for long. 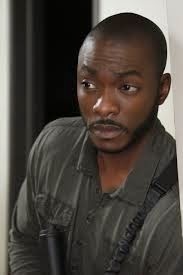 Coulson: If I come out, will you shoot me? Cos then I won't come out. Coulson's leadership of Tahiti is shown in more detail and has consequences in series 2. The hypographia he mentions on the video is particularly significant as we'll see more of the writing very soon. Coulson and General Talbot never have positive encounters, here Coulson beats him up. Later there will be kidnappings.